Writing a cookbook is fun and fattening! I say this from experience. My Scottish baking book (Simply Scottish Cakes & Bakes) found me putting on 10lb in weight over the months it took to bake and test all the recipes. Bear this in mind if you are planning a cookbook, especially one full of sweet stuff! Other slightly more serious things to take into account are time and money. Ingredients cost money so budget for this in advance if you can and always keep your receipts. You will need these for your accountant as once you start selling books you’ll be self employed. If you are thinking ahead and planning your recipe ingredients beforehand (always a good plan) then budget for more than you think you will need. It will invariably take more trial and error than you imagine to get your recipes right. Timing is everything and not just in the time spent actually cooking in the kitchen. If you are doing your own photography as I do and using natural light you’ll have to plan your cooking accordingly. For the baking book this wasn’t really an issue as baked goods tend to look pretty good for photography for a day or two. However for A Wee Taste Of Scotland when I was making party food a lot of it had to be photographed straight away while it looked fresh, hot and at it’s best. I had to make things and know there was enough good light to photograph them as soon as they were ready. Shooting in spring and summer means more available light time. In winter here in Scotland it gets dark so early you really are limited on time, whereas in summer we have light well into the evenings so you can get a lot more work done in a day. For my baking book I was working with a lot of traditional recipes and putting my own spin on things but when you are working on a lot of recipes from scratch you’ll require a lot more time for trial and error, so factor that in to your schedule. Set yourself deadlines and try to stick to them. Leaving anything till the last minute and piling in a load of work all in one day is not a good idea, especially if you have family commitments as well. This all just adds up to stress, stress, stress and that’ll take the fun out of anything. Think of the layout of the book all the time. Where are the recipes going to be placed in the book? With a single recipe on one page and photo on opposite page, or with photo on same page? If you are working with a publisher you will probably be given a page count estimation for their style of printing. It’s up to you to make sure you’ll get everything you need into that framework. I used to use pen and paper and draw out double boxes to represent two pages together and set this out on a large sheet of paper so I could just fill in the blanks putting ‘photo’ (and actually an tiny print out of actual photo after I’d done it) on one side and writing the word ‘recipe’ on the facing page. This way I could see how the book would eventually look. Nowadays I use Serif Page Plus for cookbooks and this does all the layout work for me then creates a nice PDF of the whole thing. What bliss! Even if you already have a publisher you will be expected to promote your book. Set up social media and push, push, push. Blog about your new cookbook and do some sample recipes on your blog. Build up excitement well before the book is due to come out. Once it is actually out then try to get yourself some media interest from magazines and newspapers and on local radio. Remember the glossy mags work about three months in advance so you’ll have to get them a sample copy and information before the book actually comes out if you want to be included. Get speaking gigs so you can sign books there. I’m lucky as I do a lot of talks and demos at big foodie events so can make sure I work on recipes to match the book I’m promoting and do book signings at the same time. A wee word of warning here. 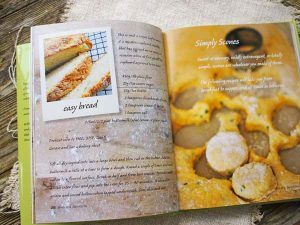 I worked directly with publishers which was fine with the first two books but was commissioned to write the Scottish cookbooks. I didn’t have an agent and ended up getting nothing for my photography and a pretty poor deal all in all. If you haven’t got an agent then I’d suggest you get a lawyer who is well versed in the book business to go through your contract with a fine toothed comb and thus get you the best deal. I really wish I’d done this. For my smaller books (or bookettes as I called them) like Gourmet Gifts For Christmas and Naughty and Nice Foodie Edible Gifts For Christmas I self published specifically to sell them at the talks and demos I was doing at the time. I had to get them printed myself and make sure that after all costs I still made a profit. This only really works if you are selling the books yourself as trying to get them into shops and make a profit is just not going to happen. Turn anything you can into an Ebook or Kindle or use Amazon Crete Space for print on demand and get your book out there in as many formats as possible. I’m still working on this for some of mine as everything takes time. If you have gone through a publisher and your book is finally out in the real world you will get a real kick when you see it in shops for the first time. Hell, I still get a kick seeing my cookbooks in stores. 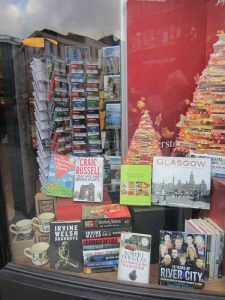 The best was seeing my Scottish baking book in Waterstone’s window in Glasgow when I was in town one day. Felt like jumping up and down saying ‘I wrote that’ to anyone who’d listen. Instead I took a photo on my phone, it was a great moment. So there you are, writing a cookbook is fun but hard work, hope this helps if you are toying with the idea. Go on, give it a go.